These days we’re nothing if not connected. And so is our art; one of the most salient features of contemporary art is the drive for inclusiveness—for the dismantling of the last barriers between art object and viewer, using new technologies, novel mixtures of media, and site-specific installations. When reduced to a recipe, however, the inclusiveness can actually work to exclude the kind of complex and intimate expression we expect of more traditional art. Two solo installations at Soho20, however, succeed at engaging the viewer personally even as they exploit new trends and technologies. Venezuelan native Mariángeles Soto-Díaz turns to new media to analyze personal perceptions. A CalArts alumna, she has put her MA in Aesthetics and Politics to practical use, building through the social media a database of individual responses to her query: what color represents your current status? The string of replies (many in Spanish) are printed in a paragraph on one wall, and reappear in fragmentary form in the backgrounds of small wood panels featuring triangles painted in the relevant colors. 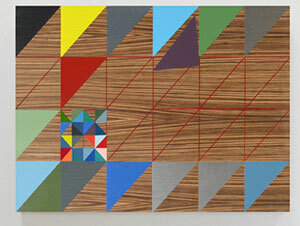 The panels in turn are connected by zigzagging lines of small, similarly colored felt triangles that connect gallery walls and floor. The effect is more arresting conceptually than pictorially—considered independently, the panels are closer in spirit to the decorativeness of Vasarely than the poetry of Klee—but the artist’s will to engage vitalizes the installation, as does her layering of the paradoxes of high-tech culture: the global extraction of very individual predilections, and their translation from the optical to the verbal and back. Elizabeth Bisbing’s collages and animations explore perceptions of nature in more personal fashion. A series of a dozen collages presents an intriguingly updated version of old-fashioned botanical studies. 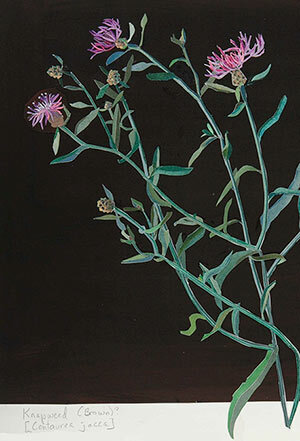 Delicately cut-out bits of colored paper, layered with the blunt physicality of collage, convey the exuberance of individual flowering plants – thistle, knapweed, tansy, and others—down to tiny veins and stamens; subtle shifts of color evoke the luminous turnings of petals from light to shade. Another series adds a mixture of the innocent and the sinister, combining the flower motif with images of the artist’s childhood alter ego (“Little Betty Jane”) and her encounter with giant insects and other monsters. A natural outgrowth of her collages, two of the artist’s stop-action animations are also on view. The storylines of these videos, both depicting a little girl emerging from and finally subsumed by nature, may not be groundbreaking, but they possess a poignant intimacy of description and technique. For good measure, the installation includes a site-specific work: a collage of a hibiscus plant with four small Betty Janes (constructed originally for the animation “The Swamp”), clambering up one of the gallery’s walls.